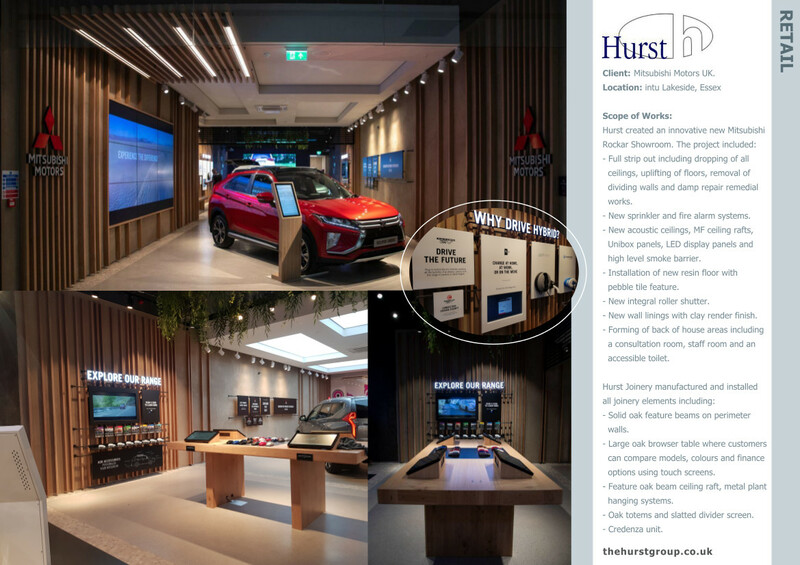 Hurst delivered the fit out of a new innovative retail showroom for client Mitsubishi, within the Intu Lakeside Shopping Centre in West Thurrock, Essex. Hurst worked collaboratively with London-based creative agency Dalziel & Pow who designed the store, consultant Paul Adams and the team at Intu Lakeside. The 1,281 sq ft showroom is split into a number of experience zones with the fixtures and fittings reflecting the bold, adventurous nature of the SUV-focused brand. The store features interactive digital displays and inviting analogue content that encourages customers to discover more about the manufacturer and the advanced features of its vehicles. Honest, natural materials such as clay render and untreated timber, natural greenery and raw textures excite the senses and bring the outdoors in. Hurst Joinery were responsible for the manufacture and installation of all joinery elements. These included solid oak feature beams on the perimeter walls and a large oak browser table where customers can seamlessly compare models, colours and finance options using touch screens. Also required were a feature oak beam ceiling raft, metal product hanging systems, 2 oak totems to hold touch screens, rear credenza unit and oak slatted divider screen.